With their modern design, these Hilgrove chairs will look stunning in any indoor or outdoor space. 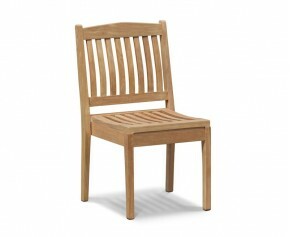 Featuring a slatted back and seat and a cupped seat, these teak garden chairs are as comfortable as they are stylish. Our Hilgrove chairs are handcrafted from the finest grade-A teak, so not only are you guaranteed durability and longevity, you also are assured weather resistance. 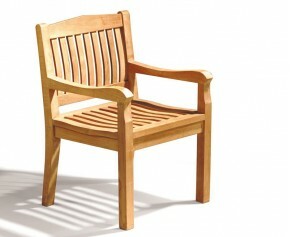 A garden favourite, this Hilgrove garden teak armchair is sure to impress family and friends. Manufactured from the highest grade plantation teak, this Hilgrove garden teak armchair has been built to last and can be left outdoors all year round with minimal fuss, guaranteeing years of fruitful use and highlighting our great value for money. There is no need to take these teak garden chairs indoors during the winter, ensuring minimal fuss and fruitful use. Our Hilgrove chairs come in a range of styles, from stacking chairs to armchairs, so you are sure to find the perfect teak garden chairs to suit your personal style and purpose. Browse our range of Hilgrove chairs.